On November 9, 2012, the Supreme Court announced that it will hear a case brought by Shelby County, Alabama, challenging the constitutionality of the Voting Rights Act of 1965 (VRA). 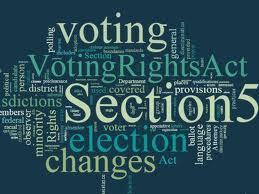 Under section 5 of the VRA, changes in voting procedures in a “covered” jurisdiction cannot be made without preclearance by the federal court in the District of Columbia or the United States Attorney General. During the 1950s and '60s the federal government’s efforts to eliminate discriminatory election practices with court cases were frustrated for many years. As soon as one discriminatory practice was proven to be unconstitutional, a new one would be substituted requiring round after round of lengthy and time consuming litigation. To put an end to this, the 1965 Act included special preclearance provisions targeted at states where the potential for discrimination was the greatest. Section 5 was extended for 25 years in 1982. In 2006 Section 5 was extended for 25 more years after Congress found that systemic, race-based voting abuses continued at very high levels. Because Alabama is a covered jurisdiction, Shelby County was obligated to obtain clearance before it changed any election procedures. Instead of seeking preclearance, the County filed suit in the U.S. District Court for the District of Columbia seeking a judgment that Section 5 of the VRA is unconstitutional. The County is relying on a 1997 case, City of Boerne v. Flores, in which the Supreme Court held legislation enacted under section 5 of the Fourteenth Amendment must be "congruent and proportional" to the harm it seeks to remedy. It claims the legislative record of the VRA's 2006 reauthorization lacks sufficient evidence of systematic voting discrimination in covered jurisdictions. If the Court accepts this argument, it would rule that Section 5 is unconstitutional because it is no longer "congruent and proportional" to the problem it seeks to cure. Shelby County's suit was prompted by the 2009 decision in Nw. Austin Mun. Util. Dist. No. One v. Mukasey (NAMUDO) in which Chief Justice John Roberts' opinion identified “serious questions” about Section 5’s continued constitutionality. Roberts' said the exceptional conditions in southern states justified the law in 1965, but the violence, intimidation, and subterfuges that justified Section 5 no longer exist. Justice Clarence Thomas filed a separate opinion in which he argued that Section 5 is no longer needed for essentially the same reasons. The trial and appellate courts in the Shelby County case reviewed the record of evidence on which Congress relied when it reauthorized Section 5 in 2006. That evidence included thousands of pages of testimony, reports and data regarding racial disparities in voter registration, voter turnout, and electoral success; the nature and number of Section 5 objections; judicial preclearance suits and Section 5 enforcement actions. The record also contains data concerning successful Section 2 litigation; the testimony of federal election observers; evidence of racially polarized voting. The Congressional record contains numerous examples of modern, "second generation" instances of systemic racial discrimination in voting and many examples of overt hostility to black voting power. The record also shows that between 1982 and 2005, minority plaintiffs obtained favorable outcomes in 653 Section 2 suits filed in covered jurisdictions, providing relief from discriminatory voting practices in at least 825 counties. Given the sheer magnitude of the evidence, a decision to strike down Section 5 would ordinarily be unlikely. The Court would have to ignore the mountain of evidence in the record and set aside Congress' factual determination concerning systemic discrimination in covered jurisdictions. However, the doubts expressed in the NAMUDO opinions prompted a number of challenges to the Constitutionality of the VRA. The predilections of the Court's conservative majority make the outcome in Shelby County difficult to predict. The case could end with the Court striking down Section 5. If that unfortunate and unwarranted outcome happens it would not invalidate the VRA in its entirety. Cases still could be brought under Section 2 which applies nationwide to any voting practice that results in the denial or abridgement of the right of any citizen to vote on account of race, color, or membership in a language minority group. Section 2 is permanent and has no expiration date.